One of the coolest opportunities I got in 2018 was getting to do fashion-related segments on Cincy Lifestyle, a local TV show that airs on WCPO. We switched things up to kick off our 2019 collaboration and went offsite to film for our most recent segment. Spoiler alert: it was a TON of fun! I typically feature boutiques during my appearances on Cincy Lifestyle and while the clothes are stunning they don’t necessarily fit into everyone’s price point. 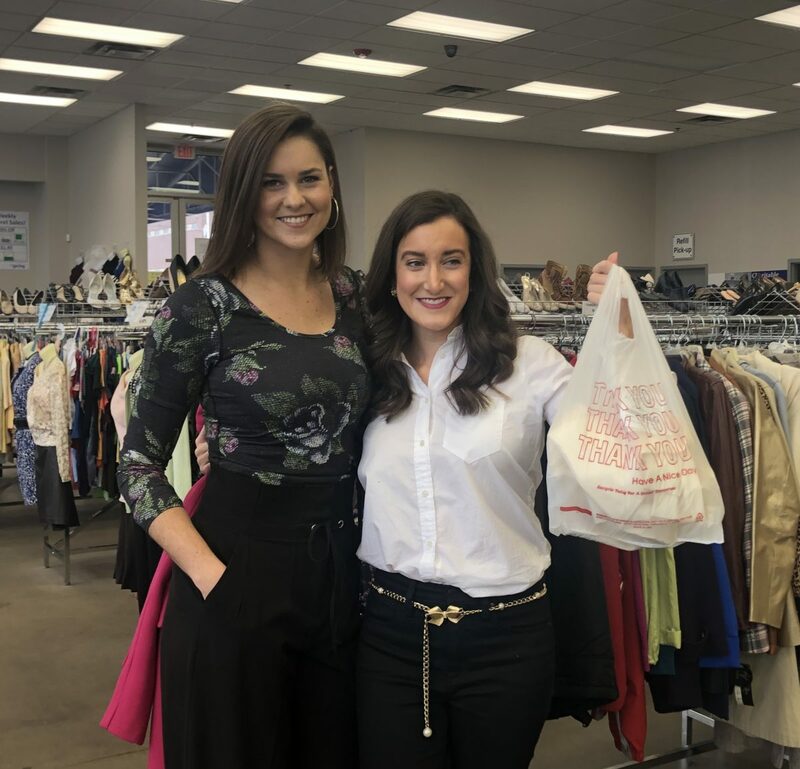 To show you that you can score fashionable finds at any price point we headed to St. Vincent de Paul in Western Hills to show you the amazing fashion you can purchase at a major discount. Allie and I scoured the massive store, collecting items to put together a cute outfit for little cost. The Western Hills St. Vincent de Paul features an “upmarked” area of the store that houses items considered more upscale. Don’t just spend your time here though, because I found a lot of great brands in the general aisles as well! I was impressed by how organized the store is, especially with the volume of items coming in. This made the shopping experience a whole lot easier and less stressful. Also, I didn’t get to check out the jewelry section for as long as I would have liked, but I did see some great pieces that would look good in any ladies jewelry collection! Sidenote: When I donate items, St. Vincent de Paul is where I tend to go. The process is super easy and I love their mission. We put two outfits together: one that’s more classic and perfect for work, and a more feminine edgy look. This red leather skirt was my perfect size and I loved the shade of red. A red leather skirt may be intimidating but you can actually wear it a ton of different ways. I paired this with a black cable knit turtleneck and black heels, but you can easily wear a crisp white button-down shirt and create a more office-ready look. I fell in love with this second look. These simple beige pants can go with virtually any item in your closet and tailored pants are having a fashion moment right now. I spotted this thick cream colored button down top from Liz Claiborne and loved the quality and construction. I believe the top has silk in it and I loved it so much that I bought it after we filmed! The top looked stylish with the beige pants, but we added some color by pairing this colorful plaid jacket on top. This was also a Liz Claiborne piece and I regret not buying this. It was very classic American prep and the oversized fit made me feel warm and comfortable. There are a few tips to stick to when thrift shopping if you want to maximize your experience. You don’t always have to buy pieces in your size. Oversized clothing, especially jackets and blazers, are very on trend at the moment. The cream shirt I mentioned that I bought is actually a few sizes bigger than I typically wear and it’s a petite! I love the fit and although the sleeves are a bit big I can just bunch them up past my elbows, which instantly adds an effortless flair. Shop for off-season pieces. Want to score pieces that others may not be looking for at the moment? Shop for spring and summer pieces in the winter and vice versa. Since it’s extremely cold right now, people are likely shopping for coats and warm layers. That means the lightweight summery pieces are probably not getting too much attention, which means optimal options for you! Have patience. The best advice is to have patience! Let’s face it, thrift stores are huge and can feel intimidating the second you set foot inside one. Go in having set aside a few hours and be prepared to do some digging. Have fun with it, be patient and you never know what incredible gems are waiting to be discovered!